Have a look at the picture below. It looks like an Epcot future world pavillion doesn’t? Except that it’s not. 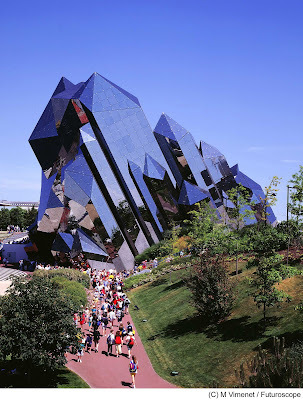 It’s some of the stunning futuristic buildings of the Futuroscope, one of the most interesting french theme park. 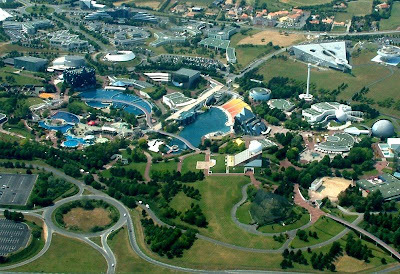 Located at only 90 minutes by train from Paris - with a direct train station access to the park, the Futuroscope opened, in fact, 5 years before Disneyland paris. 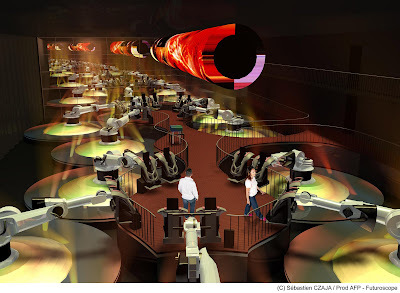 The concept was to create a theme park that will be a tribute to all the image and projection techniques, including simulation rides, and not only the one existing in the “present”, but, too, to introduce the new techniques that will appear in the future. 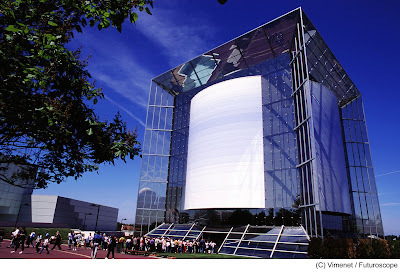 If you like IMAX, the Futuroscope is undoubtedly the biggest IMAX “show-room” in the world, including some you’ve never heard about, like the one called the “magic carpet” which include two giant screens, one in front of you and one under you. 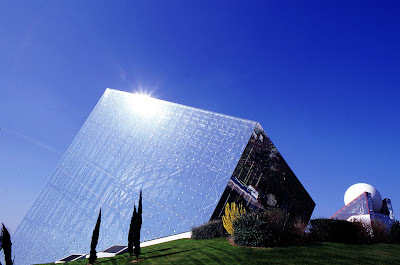 The foundator of the Futuroscope was René Monory, the president of the Vienne region in Francen in the late 1980s with the ambitious aim of “harnessing” the future. His initiative was a success, encapsulating the aspirations of the French and their steady reassurance that technology was the way forward. This first video will show you some of the Futuroscope attractions. 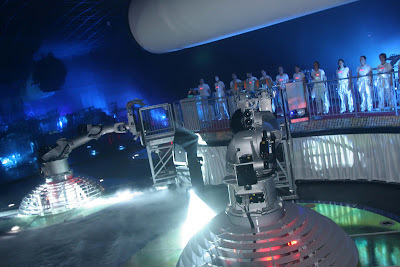 I will talk in a future article about the 2008 new attractions, but recently, they introduced a new theme, “Robots”, with two major attractions “Dances with the robots” and “the Robot zoo” . Let’s begin by “Dances with robots”. This breathtaking show use ten 7-metre-high robots performing a dance routine you just won’t see anywhere else. 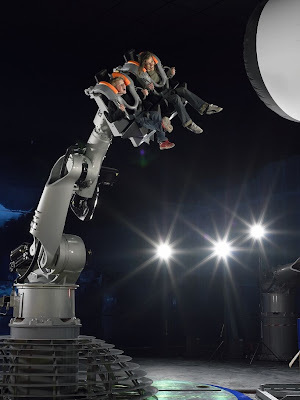 The attraction is a technological gem in which two passengers take their seats at the top of robots inspired by the manipulator arms found in the car manufacturing industry. Once safely strapped in, they are waltzed around in all directions by centrifugal forces that tempt the forces of gravity and guarantee a giddy thrill as they play an active part in a ground-breaking, grandiose and unusual ballet that moves in time to a series of musical sequences. It does not matter whether visitors are watching from the mezzanine floor above the action or are actually in the dynamic seats, they will all enjoy this new and exhilarating form of artistic expression. These huge robot arms are coming from the Kuka technology, and look at them closely, as it was the same kind of robot-arm that was envisioned for a WDI attraction on the "Incredibles" theme...until Universal succeed to have the exclusivity of the technology for a future Harry Potter attraction, opening in 2009. However, the Universal exclusivity may be only on the U.S territory. Which could mean that all is not lost, and other Disney theme parks, like Tokyo Disneyland could have in the future this "Incredibles" attraction...we'll see. 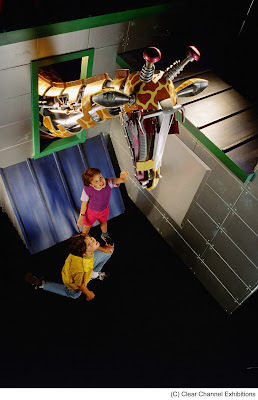 In the meantime, here is a making-of video of this robotic attraction. Let's come back to the Futuroscope, and this next one is “the robot zoo”, that “combines fun and learning to deliver an enjoyable and enriching experience”. 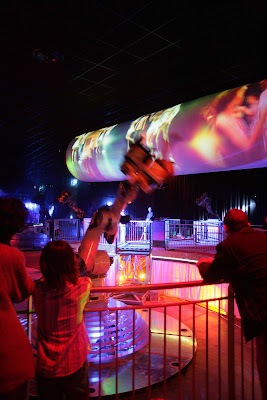 Housed in a circular attractions theatre, it’s an interactive journey where the emphasis is on the biomechanics of the giant robot animals to give visitors an insight into how real animals live. Six mechanical creations combined with a range of entertaining and educational activities make this an amazing safari . 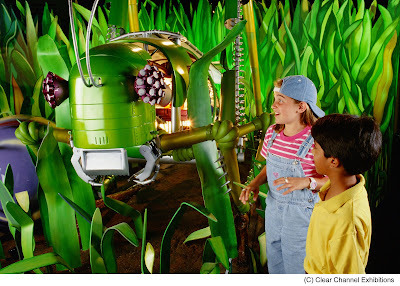 This one-of-a-kind zoo uses creepers, umbrella pines and other tropical plants to recreate a natural setting in which to see large robots of a chameleon, a bat, a giraffe, a grasshopper, a giant squid and a fly. The mechanical movements of these robot animals mimic the movements of their real-life equivalents. Visitors can see the pistons and pumps that act as muscles, the tubing that replaces the intestines, the computer brains, etc. 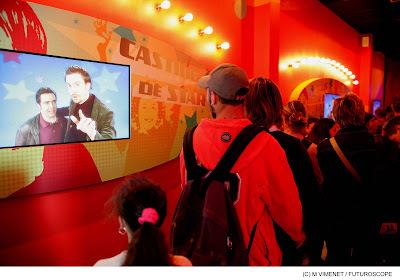 The attraction is boosted by twelve interactive experiences. 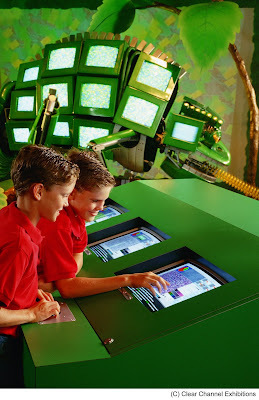 Around each robot animal is a series of amusing play activities so that visitors can interact with the animal. This attraction shows the magic of nature in a fun way and appeals especially to the youngest children. Of course there is many other attractions, with new movies that i’d like to let you know about, beginning by “travellers by air and sea” , the movie at the “magic carpet” pavillion: Voyageurs du Ciel et de la Mer takes its audience on a poetic and ecological odyssey that cannot be seen anywhere in the world but at Futuroscope, in a theatre that boasts the Double Imax® format. 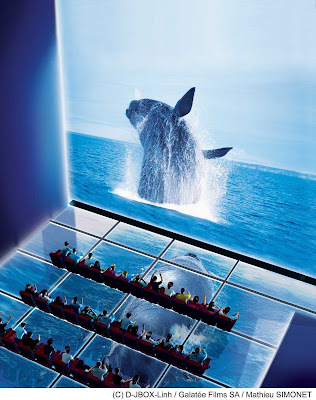 Two gigantic screens, one in front and one underfoot, let the audience fly with the birds above the whales and dolphins. As viewers are totally immersed in the film they go “beyond mere emotion, into a world of unadulterated thrills”. The building itself consists of two areas, one above the other, separated by an oblique glass floor. In the upper area, nearly 250 seats in tiered rows face a giant 672 m2 screen. In the lower area, a second inclined screen, 748 m2 large, stretches out beneath the spectators' feet. Two films are projected simultaneously from two projection rooms equipped with IMAX technology. Another attraction, “Race For Atlantis” is an astounding, lightning-quick 3D race into the mythical city. 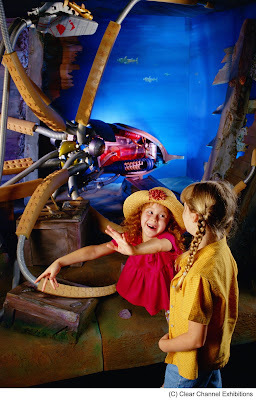 Take the controls of your shaky chariot and charge headlong to the aid of Atlantis. There is too a “dark ride” . It’s called “Star of the future” where you can take a look inside a major film studio, feel the buzz of the film set and discover the secrets behind the special effects. Visitors are enrolled in an audition and their acting talents are put to the test. Next, they board the pods and travel behind the scenes of 8 film sets to discover the atmosphere and the technical trickery used. There is also a not-to-be-missed-attraction: “Journey into the Dark” , an amazing experience, and probably one of the most simple concept i ever seen - although it’s a litlle bit more difficult to built than it looks. Why? because it’s total darkness! you can’t see anything - nothing at all, and that’s the goal: to try to make you feel how blind people are experiencing the world...”More than 70,000 visitors have already visited "Les Yeux Grands Fermés" - "Eyes wide shut" - in which they are led on a fun walk in the dark through several specially arranged zones prepared using objects, smellsand sounds. new way as they are spurred on by a hundred different sound, touch and smell stimuli. The Futuroscope also have a night show on the Futuroscope lake. And the new evening show “the forest of dreams “ is better than ever! “Somewhere out there on this planet" a new show created by the artists from Skertzo in association with Parc du Futuroscope’s own teams, sets the 7,000-m2˜ water stage a glow with the grace and power of images against water screens, pyrotechnic effects and blazes of light. 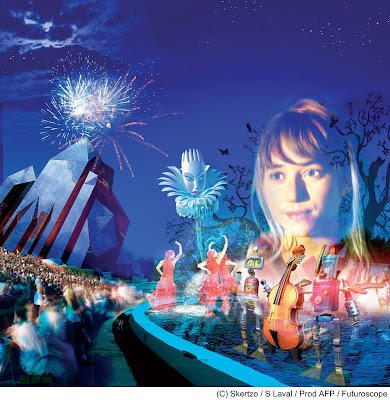 Futuroscope is already known for the quality of its evening shows, and here it offers its most ambitious and consummate production yet in terms of technological achievement and rich aesthetic touch. 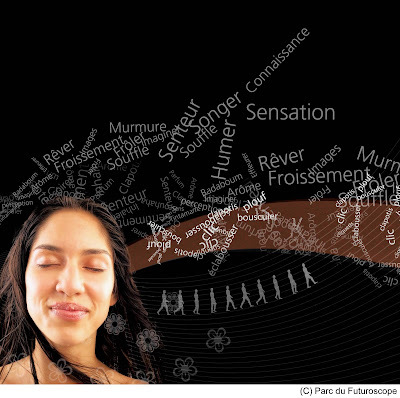 www.futuroscope.com - and there is an english version! 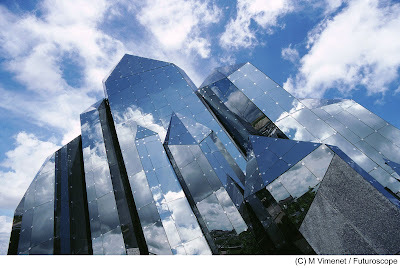 Thanks for your great blog and particulary for this article about Futuroscope (yes, DLP is not the only theme park in France :-). For your information the "Robot Zoo" is now closed and replaced this year by the "Castle of Giddiness" a walk trough with the feeling that you are walking on the ceiling. Great pictures on the Futuroscope Theme park. Although this seems like a boring theme park with a bunch of IMAX-like edutainment shows on the surface, it actually looks pretty cool and decent. So... Is that Race for Atlantis show you mentioned the one that was installed in Vegas in '97? I worked on that show and was really bummed when I heard it was going away. If it IS the same show, it's a beautiful ride with some really interesting design elements. 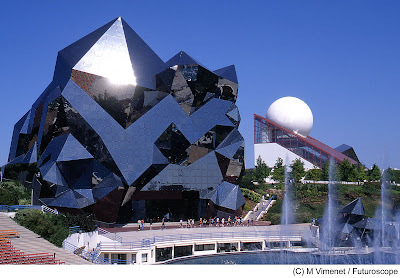 It was opened in 2000 in Futuroscope (but it could be replaced in 2009 or 2010). Sorry to say this, but this article sounded way too much like a commercial to me. Also i think that the Futuroscope is a terrible themepark. The architecture always looks good on photos but in most cases is nothing more than facade-architecture (although it claims to be "real"). The interiors of the pavillons are mostly ugly and have no similarities and connections with the exteriors. And with the exception of the Kuka ride and the Star du Futur darkride, the park is as entertaining as watching the Discovery Channel for 10 hours in a row. And while i know this is the pride of the French (for whatever reason), there are parks like the Puy du Fou you can be really proud of. And yes, it is like being on Discovery channel for 10 hours, this is why it is great! It is an absorbing and informative post. It has been very helpful in understanding of diverse things. I'm sure most people will agree with me.